Paul Straughn and Flashlight Jackson are thrown together by geography and circumstance. They grow up on adjacent sharecropper farms and long for the American Dream in a world not yet ready to witness their success. Paul has the advantage of being born white, but his fortunes erode from there. He is deeply in love with Karen, but cannot tell her because of his suffocating fear of rejection. He is obsessively sensitive to the clubfoot he is born with and emotionally flawed by the abandonment at birth by his mother. In the middle decades of the twentieth century in rural Bonds County, Georgia, Flashlight struggles against the barriers he encounters because of the pigment of his skin. As he matures, he strives to satisfy the yearning in his soul for acceptance and respect. 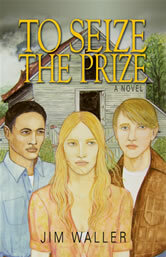 To seize the prize of their long striving, the two young men must first find the strength to overcome their own individual demons, and come to terms with the long-held tradition of racial separation that seems to overwhelm them at times, and may prove a free fall to Paul’s ultimate destruction. The young men experience three decades of Georgia history, including the desegregation of public schools and the South. As they grow toward their goals, they discover that, rather than obstacles, adversities are challenges to be overcome. This entry was posted in Books, Fiction and tagged Jim Waller on April 15, 2013 by webmaster.